Where: Centrally located, Perryville is approximately an hour and 20 minutes from both Louisville and Lexington in Perry County. When: The park is open from daylight to sunset, seven days a week. The Museum and Gift shop are open 9am to 5pm, Monday through Saturday and 11am to 5pm, Sunday | Beginning April 1 to October 31 | Call for availablity in the offseason. Creature Comforts: Restrooms, a pavilion, and picnic tables are all available onsite. Everything is very clean and very well maintained. Snacks are available for purchase in the Museum and Gift Shop. Why: Kentucky has been a battleground for the soul of our country on more than one occasion. During the Civil War, Abraham Lincoln feared losing Kentucky to the Confederacy would mean losing the war. As the largest Civil War battle in Kentucky, the Battle of Perryville marked the climax of an attempt to add Kentucky to the Confederacy. The battle, which took place on October 8, 1862, left the town of Perryville in shambles and led to 1,431 casualties partly as the result of 90 cannons that were positioned across the field of battle. You will be amazed at the absolute unspoiled beauty of the grounds. During the summer the fields are colorfully speckled with a wide variety of native wildflowers including the monarch loving milkweed. The trails are very well defined, and there are interpretive markers strategically placed through the fields explaining each part of the battle and pointing out significant areas. Main trails are well marked by blue bullets on posts throughout the grounds. Where to Start: First-time visiting? Head straight to the museum and gift shop to be counted as a visitor, get oriented and plan your visit. Admission to the museum is very reasonable. Adults $4, children 7-12 $3.50, and admission is free for children under age 6. There are special rates for groups, military, and seniors. Park admission is FREE. The staff will help you plan your experience. There is an introductory film, an exhibit, interactive demonstrations and artifacts to investigate. Ask at the front desk about scheduled demonstrations. 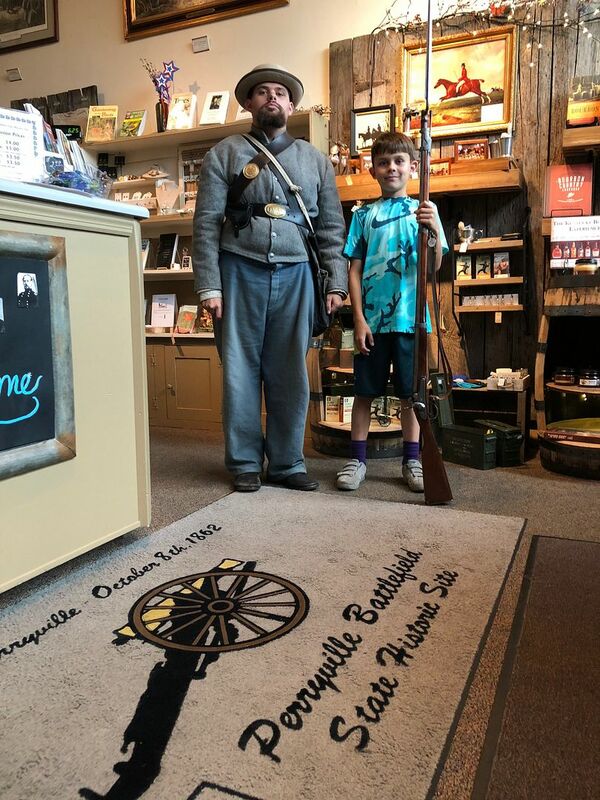 It is not uncommon to get a chance to fire a replica Civil War musket. There are also more than 1,000 acres of historic countryside to explore. 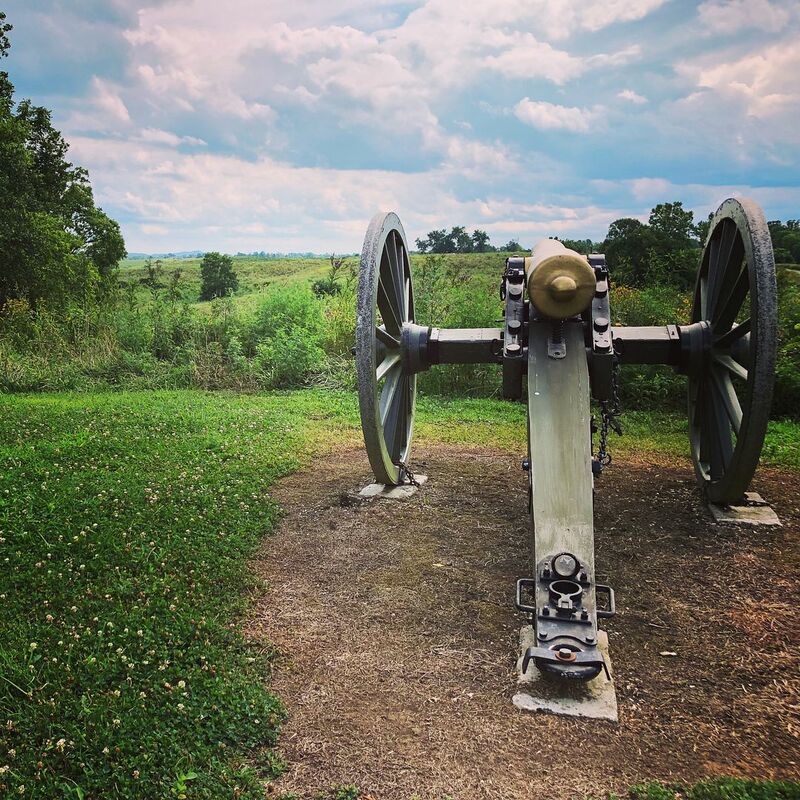 We recommend heading to the epicenter of the 1862 battle at Loomis Heights, where the Union Army tried repeatedly to hold their line in the face of Confederate soldiers advancing from the northeast. The Jones Trail starting at Loomis Heights follows the main gravel road and loops across to the Confederate cannons at Lumsden's Battery and ends back at Map Marker 17. This trail gives a good sense of the close proximity between the different armies as well as the geographical optical illusions that plagued the battle. There is definitely no replacing seeing something with your own eyes to help history come alive. Disclaimer: Part of the museum admission includes a film about the tumultuous events of the October 1862 battle. The film does contain graphic elements that may not be suitable for younger children. The film does, however, provide an essential overview of the history of the battle and is highly recommended. 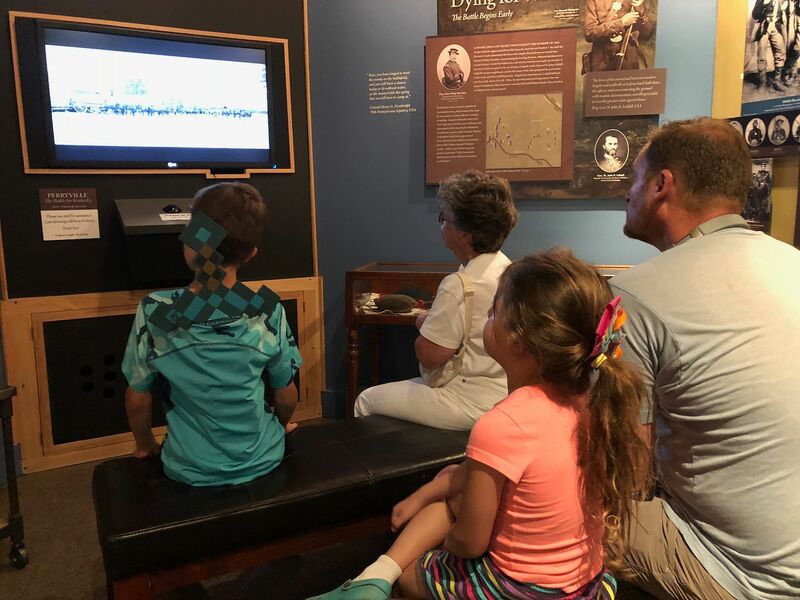 We ended up dividing and conquering on the video, taking the younger kids through the gallery while half the adults watched. Before You Go: Cell service is very limited once you are onsite, so plan ahead. We recommend downloading their Perryville Battlefield App before you go: Apple App or Android App. While the exhibit space is invaluable to the visitor, the app interprets the battle as you walk a suggested tour of the grounds. If you are going in the summer be aware that there will be ticks if you hike off the gravel road. We may have collected over 15 stowaways while on a 30-minute hike. A hard copy Kentucky map might also be helpful to navigate your way in and out of the site. We struggled to maintain our access to google maps once outside of Danville. Mary Pope Osborne. Magic Tree House #21: Civil War on Sunday. 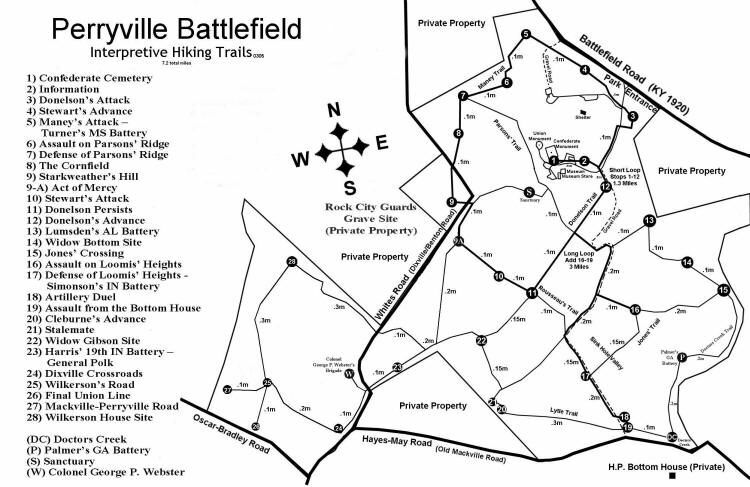 Visit the Friends of Perryville Battlefield for more information. Read a review from LexFun4Kids of the 2016 Reenactment. After Your Visit: Interested in helping to preserve the site? 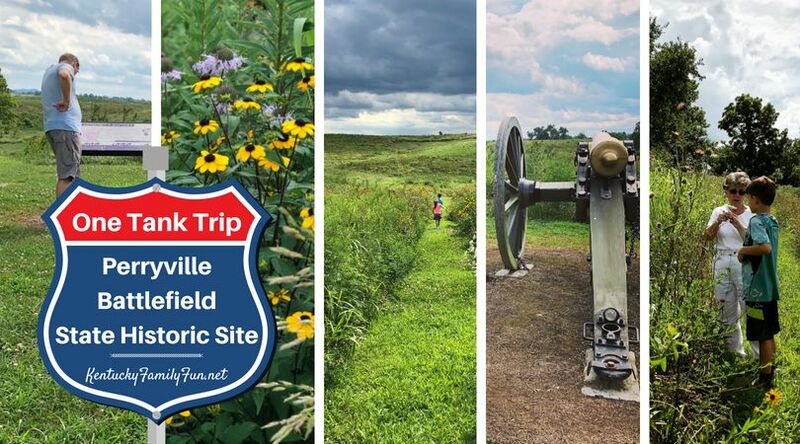 Join the Friends of Perryville Battlefield here. We just can’t say enough about how strikingly beautiful and moving the landscape is. A one tank trip to this battlefield is time well spent!